We actually won a close game! When Raymond Felton (SMH) hit the deck and allowed Tyreke Evans to put the Pelicans ahead (91-90) with roughly 2:00 remaining, the game was ready to become a replay of Tuesday’s defeat to the Grizzlies. Instead, Carmelo Anthony put forth a Herculean effort, punctuated by 42 points (13 points in the fourth), to will the Knicks to much-needed victory. But as usual, it was the game the Knicks made harder than it needed to be. STARTING LINEUP DISAPPOINTMENTS: Outside of Melo, no one in last night’s starting lineup (Shumpert, Chandler, Felton, Prigioni) managed to score in double figures. Shump was 1-6 (4 points) before leaving the game in the second with a left ACL sprain. Felton was 1-8 (5 points), while Chandler managed 4 points and Prigioni 6. With that type of production, it’s a wonder Melo didn’t gas out again in the fourth as we’ve seen in recent games. Whether you like Melo’s game or not, it’s clear to everyone watching Knicks game that he’s the main reason this beleagured squad still has a chance of making the playoffs. BENCH GUNNERS: JR Smith (19 points) and Tim Hardaway (16 points) stepped up big time to keep the team afloat. They were essential in getting the Knicks the lead in the second, and pushing it to double digits in the third quarter. 4TH QUARTER COLLAPSE AVERTED: The Pelicans ripped off an 11-0 run to take a 83-81 lead with 7:25 left. From there, the game became a seesaw battle for several plays. Coach Woodson re-inserted Tyson Chandler, who had some key rebounds (11 for the game) but also a few blunders. The worst was turning his back on the ball, which allowed Prigioni’s man to burn him for an easy layup and put the Pelicans back up 89-88 with 3:50. Luckily for us, Melo went into God mode for the remaining minutes. 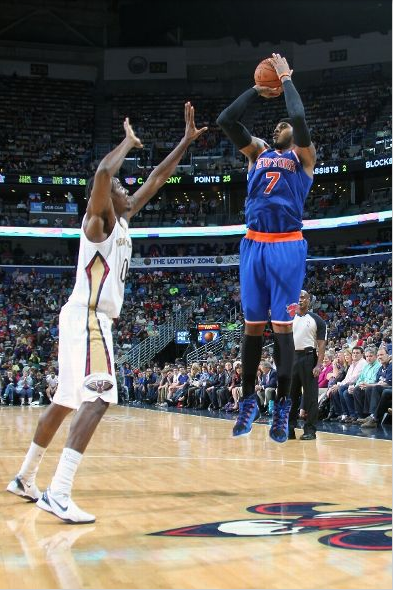 With the towering Anthony Davis in his face, Melo recovered from a block and knocked down a jumper. On their next possession, Chandler keep a baseline loose ball alive that allowed Melo to hit a layup to make it 94-91. With Davis again all over him, Melo drove for a stop and pop jumper to push the lead to 94-91. To put the nail in the coffin, Melo got a steal and then hit another stop and pop jumper (this time over an inspired Luke Babbitt) to make it 98-91. It’s a shame Melo has to run himself into the ground every game just to barely pull out wins. Unfortunately, the Knicks have no choice but to ride the man’s talent in hopes of securing a playoff berth. OTHER INJURIES: Amar’e Stoudemire sat this one out and Kenyon Martin is also nursing nagging injuries.